Unforgettable is an ironic name since the film is anything but; however beyond the title, this is just not a good movie, even on a so good it’s bad kind of way. I can’t say either Rosario Dawson or Katherine Heigl gave particularly poor performances considering the script was awful. Warner Home Video has announced the date and released artwork for the suspense-thriller, Unforgettable starring Rosario Dawson and Katherine Heigl and directed by Denise Di Novi. Click on the link below or image to the left to check out the features and artwork. 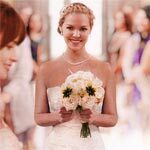 Jenny’s Wedding had the ingredients to be a decent enough romantic drama but instead the talents are wasted with a sub-par script and little to no chemistry between Heigl and Bledel. With the likes of Tom Wilkinson co-starring and from the director of Beaches, this was a disappointing flick only worthy perhaps of a rental. One for the Money is a serviceable crime-comedy but it’s also completely forgettable. Katherine Heigl is OK in the lead role and in fairness to her, I’m not sure any other actress could’ve done that much better of a job. The plot itself is pretty thin and, worse yet, absolutely predictable. As far as the Blu-ray is concerned, it has a couple interesting featurettes and the video/audio transfers are pretty good, so if you’re a fan of this movie or the supporting cast, then it’d be worth picking up, otherwise at best this is a rental. New Year’s Eve is an all around poorly made movie. The writing is lazy, the interconnecting tissue between the ensemble is at best thin and just the overall plot never really had the proper flow; even Valentine’s Day seemed to have a more cohesive story. Warner Bros. has announced the date and released artwork for the ensemble romantic comedy, New Year’s Eve starring a plethora of stars including Josh Duhamel, Robert De Niro, Hilary Swank, Jessica Biel, Katherine Heigl and Ashton Kutcher. As with Valentine’s Day, Garry Marshall returns to direct. Check out the artwork and what features will be available on the Blu-ray combo pack. Life as We Know It provides some decent laughs here and there but the film as a whole doesn’t work all that well. The first problem, and is usually the nail in the coffin for the rom-com, is the two leads didn’t have much chemistry but the bigger issue for me was the foundation and set-up which made little sense so from that point on, I just didn’t become fully invested in the plot or characters.